How Important Is Color Correcting to You? 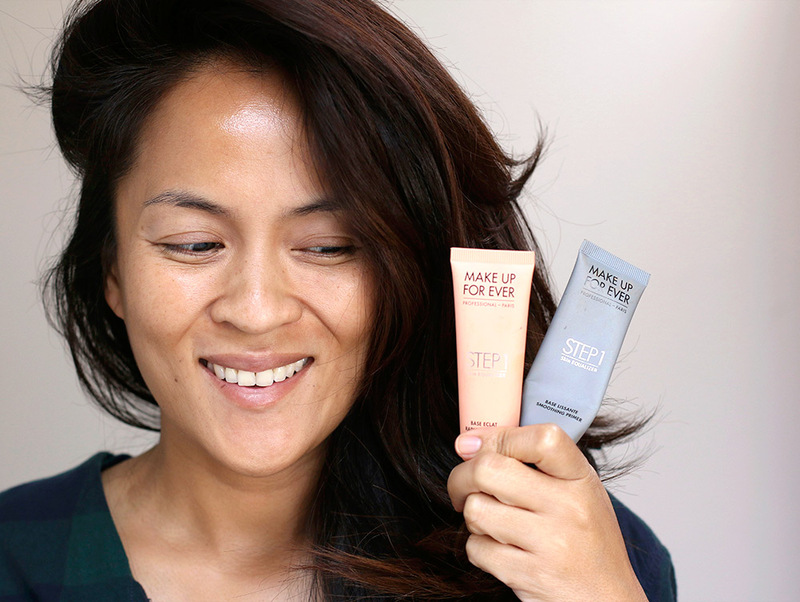 Mix and match your primers! I don’t really have many areas that I feel would benefit from me doing a separate color-correcting step. The main area for me is under my eyes, so it depends on the person. It’s not something I do every day, just because I’m usually going for the natural look these days and I don’t want to be puttin’ on layer upon layer of makeup, so I’d say that it’s moderately important to me. Sometimes when my dark circles are particularly dark, I will color correct them first with a peach/orange primer, then set it with powder, and then I’ll top it with a concealer in a shade that’s closer to my natural skin tone. I’ll do this because my dark circles are a purplish blue, and if I just go directly on top of them with a yellow-based concealer, they can look grayish (especially in pics). But the orange corrector cancels out the blue, so that when I put my concealer on top, it looks natural. There are other kinds of color-correcting products, too, and they can make a huge difference. In one of the free Sephora Beauty Classes I went to (you should totally go! ), the model was very fair-skinned and had red spots on her cheeks, so the teacher used a green corrector to cancel out the red before she applied foundation and concealer on top. It looked amazing. I couldn’t even tell there’d been any red on the model’s skin at all. Here’s a rundown of my current skin care/skin prep/makeup process, except that my current concealer regimen has changed a little. Now I use either Sephora Future Gel Serum Concealer by itself if I don’t do any separate color correcting (the shade I use already has a subtle peachy tone), or Make Up For Ever Ultra HD Invisible Cover Concealer if I feel like going the extra mile and doing more robust color correcting, because of the two shades that I use, one has an orange tint for correcting my purplish blue dark circles. I set whichever one I use with NARS Translucent Crystal Light Reflecting Pressed Setting Powder. And here are some additional tips on how I use color correcting primers in general. For me, it’s mostly a step I’ll do when I’m doing a full-on makeup look. It’s not something I do every day, but I’m curious. Is color correcting part of your regular makeup routine, or is it a once-in-a-while thing for you? Hardly ever! I have very red skin and kept hearing I should “neutralize” it with a color correcting primer… but I just didn’t feel like “me.” I like having skin tone evened out, but changing the tone of my whole face was a bit much. My color is one of those things I’ve come to embrace as beautiful in its own way! i can see how some people would want to correct under eye circles, but they’re not too obvious on me and the extra step is often too time intensive. A simple primer and light makeup gives a nice, even look. I’m trying Vapour and Kypris primers right now and love both. A little goes a long way, which is an added plus! The green concealer over spots is a great idea, and I’m tempted, but honestly it’s one more product to deal with in the morning… !!! I should use them under my eyes, I have the same problem, my concealer will look a little grey in the areas of the most issue. I’m using NARS RCC in Chantilly but Vanilla would be better for the under eye as it’s got a slight peach tone to it. I don’t color correct now. I once tried a green color corrector for my rosacea and even though I used it sparingly, I still felt my foundation looked grayer. I tend to use sunscreens with a beige, rosy or yellowish tint as my primers and feel it gives me the most natural looking results. I guess I just don’t dedicate that much time to doing my makeup. I’ve been really lazy lately and have even been skipping foundation and just dabbing a bit of concealer on my lids then doing liner, mascara and a sheer lipstick. If I remember I use powder every now and then. I never color correct. It’s too much. I really never thought about color correcting until literally the past few days as I have a few of those dark spots that are left after cystic acne goes away. There’s no scarring as I’ve kept my hands off them but I find the spots a bit distracting. So far, I’ve just dabbed on a bit of concealer and set it with powder which helped somewhat. I think when it’s time to spend the gift card at Sephora, I’ll talk to someone about samples and see what works for me. Color correcting my dark circles is a step I do every day, but other than that I dont really need it anywhere on my face. It’s important to me. I use peach corrector on myself and correctors on others. Like you, Karen, I usually save color correcting for a full-on makeup look. My undereye circles are mostly shadows, which can be kind of a pain to correct, because they only show up when the lighting comes from overhead. As long as all the lighting I’ll be in will come from overhead, I can use a spot of lighter concealer to tone them down — but, if I’m then somewhere where light comes from lamps at eye level instead of from overhead, it looks like I’ve got a light stripe under my eyes! There is a bit of blue-ish purple there, but not so much that a tiny dab of a good concealer won’t banish it. Other than that, I’ve got redness, from rosacea. It’s pretty calmed down these days, but there’s lots of redness leftover from when it was so bad that my face felt like it was on fire, and some broken capillaries, too. On most days, my base product is also my sun protection, so I’ll just pile it on until most of my redness is covered. That sounds horrible, but once I add an Hourglass Ambient Lighting Powder and a setting spray, it looks really good — when I go out, I get compliments on my skin, some people not even realizing that I’m wearing base makeup. If I want to go a bit lighter with my base product, I can put a tiny dab of IT Cosmetics Bye Bye Redness where redness is still showing through my foundation and blend it out a little, and the redness is gone. Conversely, I can use Dr.Jart+ Cicapair Tiger Grass Color Correcting Treatment is a moisturizer/sunscreen/color-correcting primer under foundation. That really gets rid of redness, and shows how light my skin tone really is once the sun damage (from living outdoors during summers when I was a kid — nobody I knew used sunscreen back in the 50s and 60s, even though it technically existed then) gets cancelled out. I also love that Sephora gel concealer you mentioned for the spots where broken capillaries want to show through my base. They even have a color that matches my skin tone pretty well! If I’m wearing cool-toned eyeshadows, I’ll usually use a warm-toned corrector under my eyes to avoid looking bruised! I’ll also put it around my mouth if I’m wearing a cool-toned lip (any other super pale people get blue-green discoloration around their mouth? Just me? Ok). If I’m wearing neutral or warm-toned eyeshadows/blushes/lipsticks, which I usually do, usually concealer is enough to fix my discoloration. I just find that unless I really take care to warm up my blue-green discoloration when I wear cool-toned looks, I can look really ill and gray and bruised. I have on occasion used the MUFE green correcting primer if my skin is super duper irritated and red. I like it because it definitely corrects but it isn’t TOO green. Sometimes with those green correctors, you’re forced to wear super high coverage products on top so that you don’t look like an alien, but I’m still able to wear light-medium coverage with this one. It used to be very important to me since my face was always so red compared to my body! It’s been better lately though, so I need to color correct less now, phew. Like the other ladies, I’m super red/pink naturally, so it’s crucial to color correct, but I’ve found with most green-tinted things its super easy to overdo it. So for me it’s mostly about enough coverage without putting on a mask, but still concealing all/most of the redness. The last 3 months I’ve been using Dermalogica’s Skin Perfect primer, which is lightly tinted and SPF 30. Even on no-makeup days I like to put it on just for a nice effect on my skin. Otherwise I just stick to getting a nice foundation base with a Real Techniques sponge and spot concealing as needed! My go-to combo this year has been half It Cosmetics CC Cream, half L’Oreal Pro-Matte, which also helps bring some yellow to the party. Not very important. Sometimes I use a little green for redness on my nose and cheeks. (One of the perils of being fair-skinned.) My skin tone is pretty even, thank goodness. Even more rarely, I’ll use yellow concealer if my eyes are dark from illness or lack of sleep.